November 18, 2015. The coach of the Sherbrooke Bulldogs and former coach of the Vert et Or, James Benoit, is preparing to face his biggest opponent, on an unknown field: ALS. The next day, he wipes off the last tears that stream down his cheeks and decides to play the game of a lifetime, one day at a time. 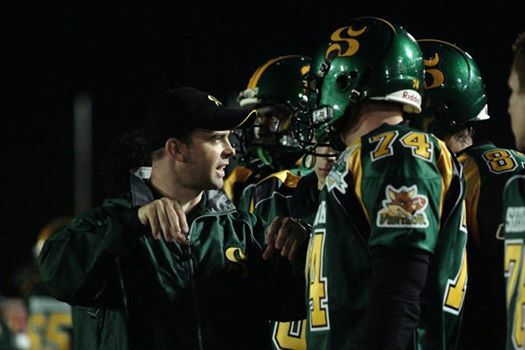 From 2002 to 2004, James Benoit had the pleasure of coaching the Université de Sherbrooke’s Vert et Or. James Benoit takes part in various clinical trials and is nowhere near having given up hope; he still exhibits all the qualities that make him an exemplary player on the ALS Team. « In the face of the disease, I persevere and I try to keep my legendary positive attitude and to continue embracing life. I still take part in activities and events with my family and friends to build unforgettable memories every week.” That is the approach that the 47-year-old man brings to his role as an ambassador by, among other things, raising funds for the Society and by sharing, with his network, news and events organized by the Society, including the Ride to Fight ALS, the cycling event that will take place in Orford from August 24th to the 26th. Almost three years after his ALS diagnosis, the Sherbrooke man is more than ever determined to play his part to support the ALS community, starting with his role as honorary spokesperson of the Sherbrooke Walk for ALS, which will take place on June 16th. “ALS Quebec is an incredible support for those living with ALS, caregivers and many people who are touched by the disease one way or another. It offers adapted equipment, financial assistance, a respite program and activities for patients, their caregivers and families, in addition to raising funds for research. Walking for ALS is an excellent way to ensure that those services continue.” The fighting spirit demonstrated by James and his colleague Jean Cameron, who is also living with ALS, has inspired their Groupe Cameron (a subsidiary of Terminix) work team to contribute to the Sherbrooke Walk in their honour. On Saturday, June 16th, starting at 9:30 am, James Benoit will be among the 400 participants who will gather at the Armand-Nadeau Pavilion at Lac-des-Nations to take part in the 13th Sherbrooke Walk for ALS. People in the region living with ALS as well as their loved ones will walk a symbolic route in solidarity with Quebec families touched by the disease while raising funds to finance research and support programs and services offered by the ALS Society of Quebec. From August 24th to the 26th, it will be the turn of 250 cyclists and volunteers to unite against ALS in Orford for the Ride to Fight ALS. The headquarters will be located at the Espace 4 saisons in Magog. A hike to fight ALS will also take place on Saturday, August 25th, at Mont Orford, as part of this unique weekend.